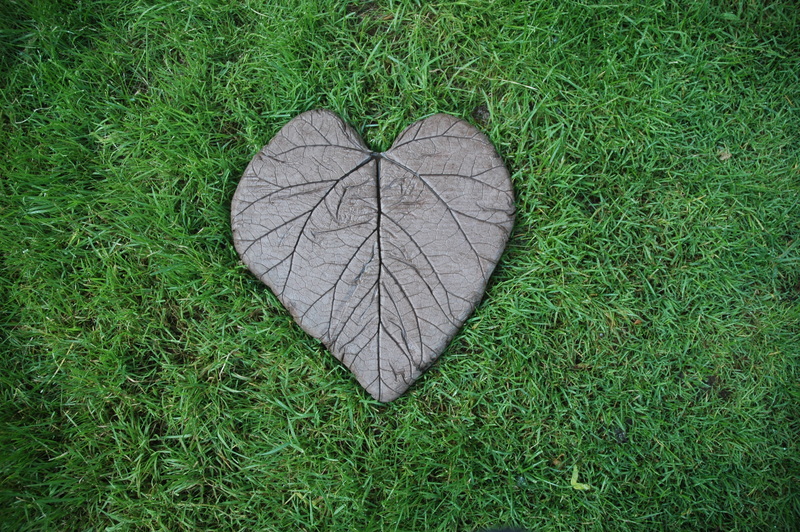 I have just started playing with making stepping stones out of rhubarb leaves. 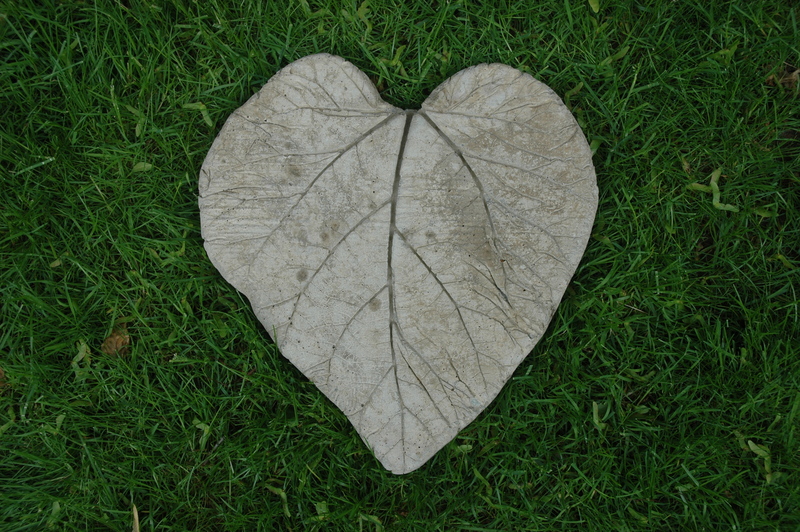 I started by making a form using the leaf as a guide for my shape. I used 2X6’s as the sides for my mold or form. I laid these out so that the whole leaf was covered and traced the leaf onto the 2X6 pieces. Then I set my band saw table at 5 degrees so that my mold would release the block after it set. I screwed these pieces of 2X6 onto some plywood and caulked the inside edge, both to seal the edge and to round over the edge of the stone. Then I sprayed the mold with silicon spray as a release agent, and placed the rhubarb leaf into the mold. I mixed redi mix concrete and poured it into the mold. 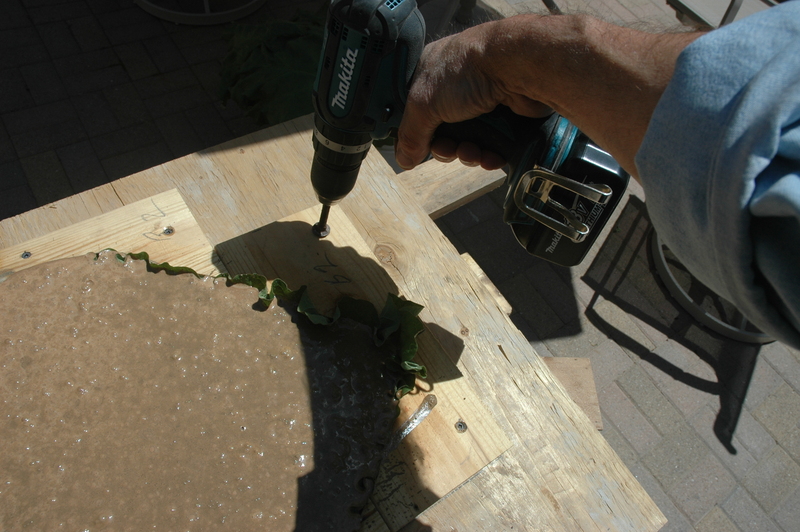 I used a 1/2″ cordless hammer drill to vibrate the air out of the concrete. After two days I popped the cast leaf out of the mold and wrapped it in plastic to keep it from dying out too fast. 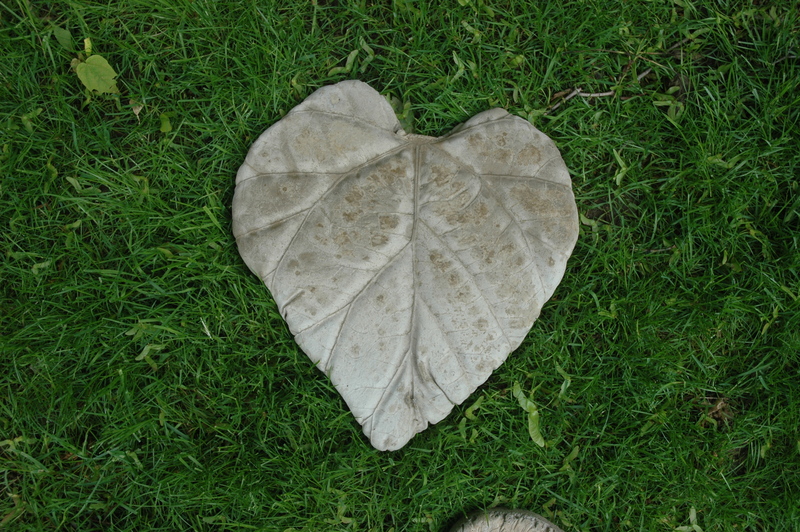 The hardest part of the process was letting it sit for at least another 5 days before removing the residue of the real leaf and exposing the imprint on the concrete. 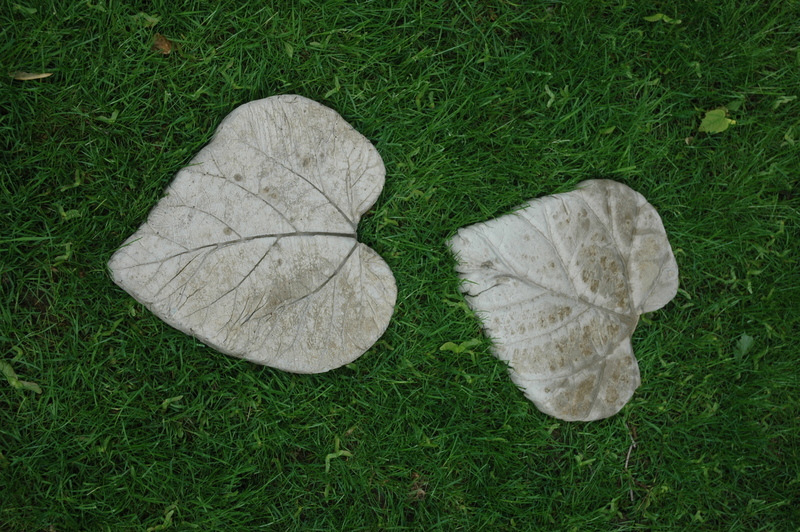 I tried pouring the concrete both on the front of the leaf and on the back side of the leaf. Both gave me different and distinct results. I prefer the front side of the leaf because it produces an imprint with fewer undercuts. This allows the leaf to release more easily. 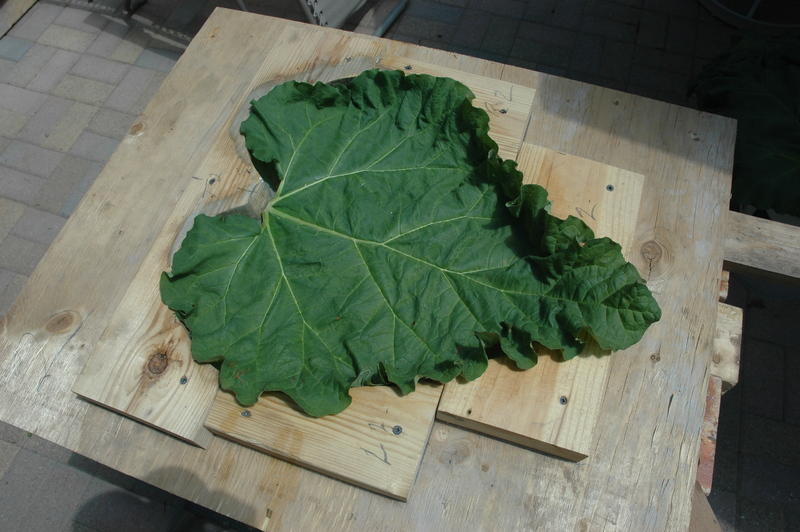 Rhubarb leaf stepping stone form. A cariage bolt and hammer drill make a good vibrating tool. 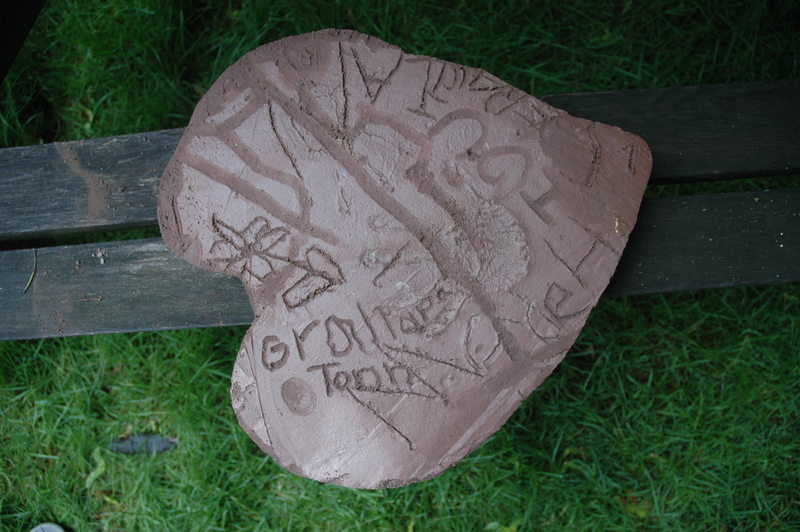 The real fun started when the concrete had set enough to put hand prints and messages on the back of the stepping stone. No one ever gets tired of leaving their mark in wet concrete. And then the actual path begins. Stones are laid out and the grass is planted. 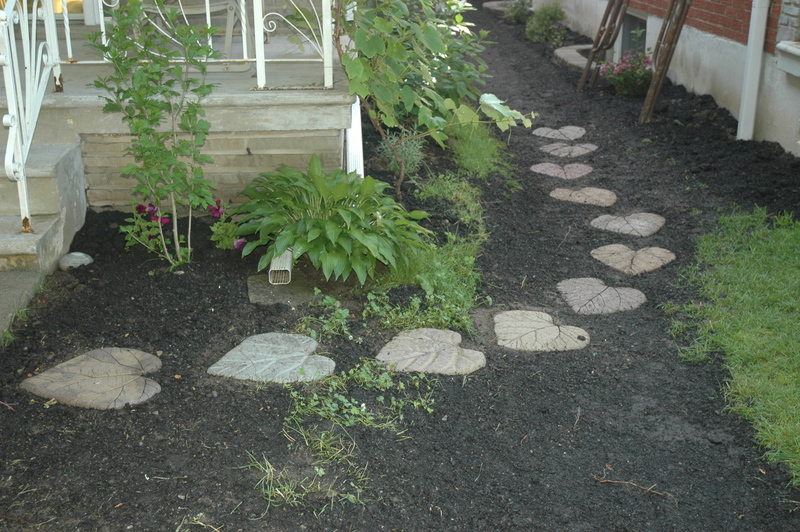 I’ll update again when I have made more stones and the grass is green and construction materials are gone. An added bonus is that I was able to slope the ground so that we no longer have a low spot that collects water. It now drains to our front lawns. These are gorgeous! I can hardly wait to see them placed in a path. I just wish i was there to see all of these things in progress! Good on you Ted. I can’t wait to show this to Karl. OMG – I love this. Inspiring…. I am going to grow Rhubarb next year so I can make these!!! Thank you so much for being so clever to work out this design and THEN sharing it with all of us>>Bless you!!! I do not have a band saw but I do have a jig saw that I believe I could use>> I have a coping saw (I think that is what it is called, kinda “U” shaped with a saw strip across) I could do some cutting off with that>> what if I used something like aluminum foil if I cannot get a lot off? I have so many places I can use these! Charlotte, thanks for your kind words. 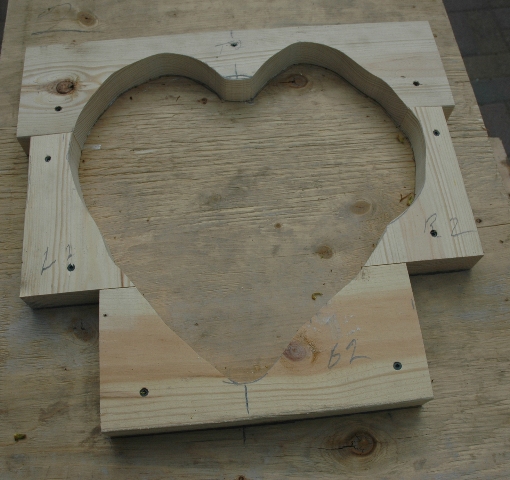 A jig saw or coping saw would work just fine. Just be sure to angle your saw a little so the concrete will pop out of the form without you having to take the form apart. I also planted rhubarb this year so I don’t have to “borrow” from my friend across the street. I I love the differnt colors you added to the mold. Would shoe polish work to?